Growth Factor Mass is the All-In-One mass gaining formula that is without equal. Containing 57g of a quality mass gaining protein blend, together with 76g of a 5-stage carbohydrate matrix, Growth Factor Mass contains an unparalleled combination of the most intelligent and hardworking sports nutrition ingredients available. Growth Factor Mass can help you build serious muscle mass, increase explosive strength and support muscle building testosterone levels. Use 2 servings of Growth Factor Mass™ daily, at any time during the day to boost mass gaining calorie intake. HOW TO MIX: For a 150g full serving, providing a power packed, high calorie, mass-gaining shake: Add 3 scoops of powder into a shaker cup or blender containing 500ml of ice cold water and shake or blend for ten seconds. For a 100g serving: Add 2 scoops of powder into a shaker cup or blender containing 350ml of ice cold water and shake or blend for ten seconds. Contains: Wheat, Gluten, Oats, Milk & Soya. May contain: Barley. Do not exceed the recommended daily intake. Store out of reach of children. 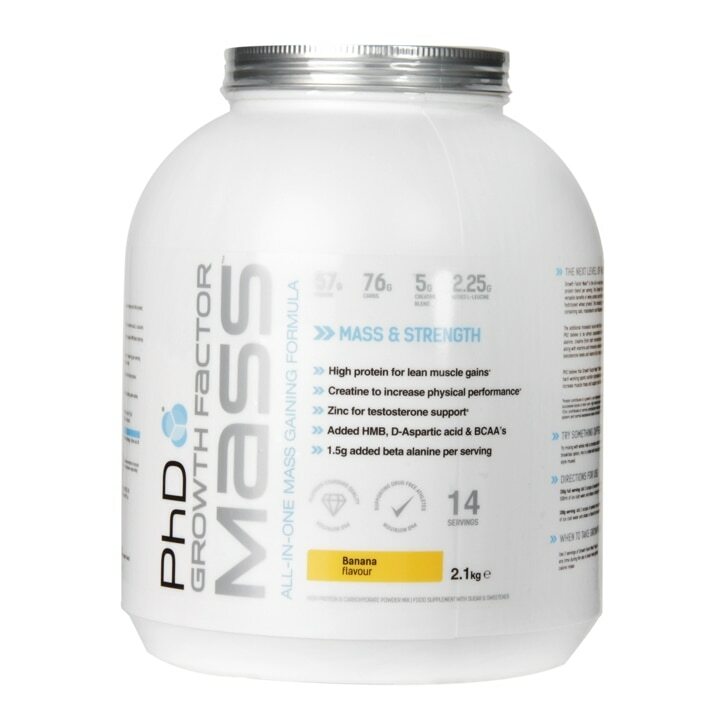 PhD Growth Factor Mass Powder Banana is rated 5.0 out of 5 by 1. Rated 5 out of 5 by ddd29 from great product Great taste, quickly absorbed, very good composition. Good strength gains and mass. A large number of servings per container.